Sandals Resorts International has broken ground on a multi-million dollar expansion of its Dover Beach property in Barbados, marking the commencement of the construction of an additional 222 rooms and suites. Dubbed Sandals Barbados “Phase II”, this expansion when complete in November 2017, will add to the existing 280-room count and firmly place the property as the largest Sandals resort in the Eastern Caribbean. The official ground breaking ceremony was led by Sandal’s chairman, Gordon ‘Butch’ Stewart, and chief executive, Adam Stewart. 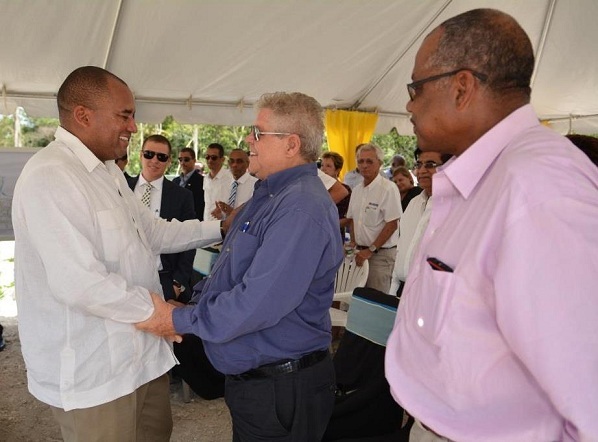 Also on hand were Barbadian minister of tourism Richard Sealy, minister of health and parliamentary representative John Boyce and several invited tourism and business officials associated with the undertaking. With this expansion Sandals is set to create an additional 520 new jobs bringing the total direct employment in Barbados to over 1,100. According to Stewart, Sandals Resorts is exceedingly grateful for the “Bajan support and hospitality” extended to the Sandals brand. He has assured that when completed, the expansion will set the stage for what is a continued evolution in hospitality in the Caribbean. Sealy pledged support to the project and commended Sandals for its invaluable investment in the Barbados tourism product. “In 2015 we welcomed 591,000 visitors to Barbados which was a new record and at least 20,000 of those were Sandals guests, so indeed we have seen the positive impact of Sandals,” said Sealy. Minister Sealy joined in turning the soil, to officially mark yet another significant undertaking in the Barbados tourism industry. On completion, the resort will offer five new restaurants, a new spa and wellness sanctuary, three new swimming pools and an entertainment pavilion complete with a bowling alley, the first for a Sandals resort. Recognising the growing demand for meetings and conventions facilities in Barbados, the Sandals expansion will also feature an expansive state of the art 10,500 sq. ft. conference facility capable of seating 550 people.